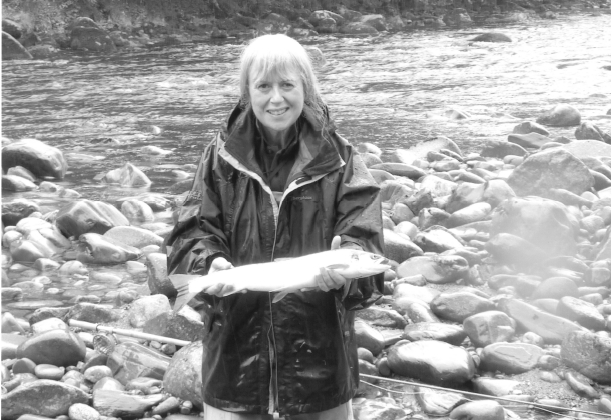 I started fishing when I was Head of Wildlife, Recreation and Marine Policy in our Head Office 10 years ago. We were promoting angling participation at the time and I thought if I was going to lead this credibly I ought to understand why people fish - and the barriers, real or perceived. So, a colleague in our national fisheries team took me trout fishing at Chew Valley. I was hooked. What I loved was spending time being very aware of my surroundings – the water, the insect life, the weather. Spending time in the moment and really looking and feeling what was happening about me. I had never done that before. I grew up in sight of Spaghetti Junction in Birmingham and no-one in my family went fishing. You can imagine my early attempts were terrible and various patient ‘fishy’ friends put up with my thrashing the waters both still and rivers in Southern England. I wondered if I would ever cast competently and that was just the beginning of being able to fish. My best friend bought me my first trout rod and reel, how could I now not continue? I took some lessons and got much more confident about going into Sportfish and the like to buy ‘kit’ even though I sometimes had to describe what I wanted it to do rather than having the right terminology. And the choice for women is quite limited – I still struggle not to trip on my salmon net, longer legs would be the answer I think. My biggest thrill was 7 years ago when a friend said a rod had become available on the River Findhorn in northern Scotland where they spent a week each July and was I interested? I didn’t need asking twice. I can still remember my first evening there, seeing my first salmon leap. Such a joy! I have just returned from my eighth trip to the Findhorn. Even the year I broke my arm didn’t keep me away. I rose one and hooked two this year… you should have seen the size of the ones that got away! There have been fewer fish in evidence when we’ve been there this past two or three years but for all the frustrations I still love wading in the river in the late evening with Osprey for company. It’s a long way from Spaghetti Junction for sure! Linda brilliant way to start fishing and great there's more women. Fishing is very rewarding . Well done Julia for getting in there and having a go. I think if a lot more women just grasped the nettle and tried this incredible sport, they would be surprised by the intoxication of actually landing a fish. I think the main wall that has to be knocked down is this thought of maggots and worms, and if they were educated in artificial or non-live bait, then it might be something they could be interested in trying. Tight lines and wet nets Julia. I'm in Scotland next month, I enjoyed your blog immensely.